It was Cotham who got into their stride first though playing down the slope and moving the ball well through the forwards and backs. The home side defence probably wasn't at its sharpest and the tourist took adavantage of the space to run in two unconverted tries. Argaum knew they would have to up their game and they responded well to captain Jamie Venner's call to tighten up their defence and keep hold of the ball. Strong running from ball carriers such as Mason Edwards and Dan Smith made inroads into the opponents half and it was a measure of how serious they took the game that they attempted a couple of penalty shots at goal, neither of them were successful however. Argaum's support play improved throughout the half and enabled them to take advantage of inroads made by the forwards and Dan Smith bullocked his way over for the opening home try, Jake Turfrey converting. The tourists were starting to feel the pace and some good counter-attacking through the backs saw Turfrey break clear and after a show-and-go to his support ran through under the sticks for a try which he also converted. Cotham now knew they werent in for a stroll and responded well to work the ball down the left wing where a chip and chase resulted in a 3rd try for them. Cotham could have been forgiven for letting things slip in the second half but they dug deep and kept Argaum at bay for the remainder of the match. Argaum were never able to establish a platform particularly at the set scrummage which denied them the chance to get their backs and particularly strong centre pairing running at the opposition. Both sides rang the changes throughout the second half with around 25 players from each side getting a runout, which meant that the shape did go out of the game a little. Defences continued to dominate as neither side could establish control and with no further score in the second period it was the Clifton-based visitors who ran out narrow victors. 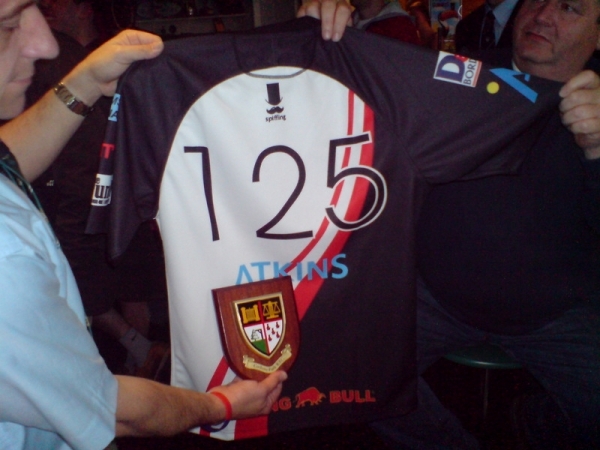 In the after match ceremonies Cotham very thoughtfully presented a special tour shirt with the number 125 which was gratefully received by the Argaum Captain, before they embarked on a very entertaining (for spectators) Kangaroo Court in the car park.